Dark and dingy spaces are the favorite hideouts for microorganisms and small animals. Attics and crawl spaces become a retreat for these living beings, and when they have to satisfy their hunger they start to nibble into the beams and other stored delights carefully stacked in attics and crawl spaces. This spells trouble, loss of property and serious money drain! 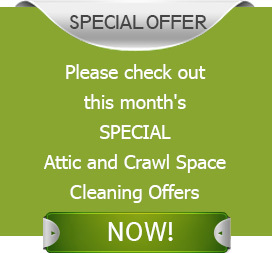 You need to get the expert eye of Quartz Solutions, the attic and crawl space cleaning services to ensure on your house on a regular basis. Insects like ants, termites, wasps, cockroaches, lurk in dark dingy corners. Rodents, mice, small animals, roof rats, errant birds, raccoons and bats love to chew on the stationary insulation wires. They eat away whatever they find and then start their process of defecation leaving behind a rancid and unbearable smell. These innocent looking animals can weaken the house. Mildew and mold need a warm climate to breed in, and they find their way into the wooden beams where they weaken them. Moisture can lead to leaking ducts. This invariably means you have to invest more in your monthly electricity bill to keep your home at optimum temperature. The attic and crawl space need to be inspected carefully so that there are no carcinogenic gases roaming around your home. Also, the structure of your home can remain sturdy and solid, only if it is clean of rodents, birds, animals and microbes. Professionals with years of experience will show-up at your doorstep to inspect your home for these potential hazards. Quartz Solutions will assess the premise using special equipment to guarantee that every step is taken in order to ensure your peace of mind. The advantages of using Quartz Solutions to clean up your Attic & Crawl Space are numerous, but the key benefit is that we deliver stellar service at competitive rates. Cedar Grove, a gorgeous township in Essex County, NJ, has a population of nearly 12,411 people and it is said to be the fourth best place to reside in Essex County. The valleys and hillsides together with the attractive Cedar trees make it a special place. 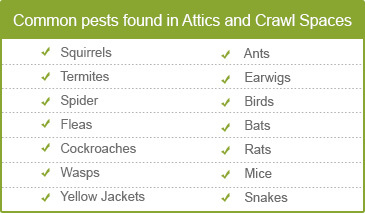 And although we have plenty of animals, you don’t necessarily want them in your attics and crawl spaces. Call at 973-536-1013 for a free inspection from the Quartz Solutions today.